The People app in Sense 6 has seen some minor visual changes, but retains the same functionality as its predecessor. You get the dialer, contacts, groups (including favorite contacts), as well as a call log. You can reorder tabs and remove the ones that you don't need (Groups or Call history). The second tab holds the texts, emails and call history between you and the given contact. The next one displays the contact's social networking updates. The dialer on the HTC One mini 2 combines your keypad, recent call list and contact list in one application accessible via a single icon. You switch between the view modes with side-swipes. There's smart dialing and it works as good as expected. Once you start typing on the keyboard, contacts will be filtered by name or by phone number. You can use a QWERTY keyboard for searching as well. The smartphone packs a neat set of call-related tricks such as automatically silencing the ring of an incoming call just by putting the phone face down or raising the volume if the device senses it's in a pocket. Our review unit didn't have the feature to automatically answer an incoming call by raising it to the ear, but HTC claims it should be included as well. The quality of the two loudspeakers remains in line the excellent-sounding HTC One mini from last year and compared to the HTC One (M7) and (M8). The sound comes out deep and well-accentuated. It's particularly nice to enjoy videos or games as the sound comes directly at you. Loudness, on the other hand, isn't all that impressive. 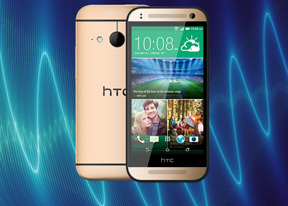 The HTC One mini 2 didn't perform very well when it came to midtones or vocals. The only place where it was able to score a good volume is the high tones. We got an overall Below Average score when we measured its loudness with our digital loudness meter. Check out more about our tests and our loudness test in particular. HTC One mini 2 is capable of handling all sorts of messages - SMS, MMS, email. There's also Google Hangouts, which can connect you to Google contacts via either texts or video calls. The HTC One comes with two email apps - the traditional Gmail app and the HTC Mail app, which merges all your email accounts into a single interface with a unified inbox. The HTC email app uses a navy blue top bar and merges it with the status bar for a nice design. As for typing, the HTC One mini 2 on-screen keyboard offers well-spaced keys, but the overlay doesn't include any gaps between them. This is only a cosmetic feature and poses no discomfort. The 4.5" display diagonal offers enough space for comfortable typing.